In this riveting historical fiction children’s book, we journey across Russia to Siberia, in search of Mayra and Georgi’s exiled parents. The story takes place during the era of Stalin coming to power in Russia. The stark details of the difficult conditions of “progressive” people under Stalin’s regime could make for a grim children’s book. However, instead, we meet goodness upon goodness, as the sheer determination of these children pulls out goodness in others. Not everyone is good through and through, but enough good things happen to let us know that even in the darkest of times, the good in people’s hearts can be accessed. I felt I was traveling day and night with Marya and her little brother, and never for a moment did I doubt the truth of what I was reading, even though the book is entirely fiction. As a way of teaching history, a children’s book like this is priceless. You can learn fact after fact, but traveling with a young child encountering the regime really leaves the most lasting impression. I would highly recommend this children’s book for any homeschool, classroom, or family who loves history. If in fact your family has Russian roots, the book is even more compelling. 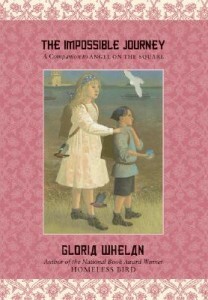 Gloria Whelan has written several other great historical fiction children’s books, including Chu Ju’s House, and Angel on the Square, which is a book that precedes this one, though this one stands alone quite well.